Seven years after the United States led the invasion of Iraq, the last combat brigade has pulled out of Iraq and turned over all combat responsibilities to the Iraqi military leaving the war torn nation with the task of rebuilding in the face of an ongoing security problem due to the insurgents. The United States State Department spokesman said that the United States involvement in Iraq was far from over including the some 50,000 US troops who will remain until the end of 2011 to advise Iraqi forces and protect US interests in the country. 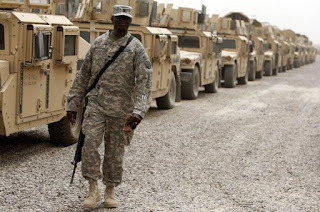 The pullout of US troops in Iraq marks the end of war to some but to students of Bible prophecy it is another evidence of the end of days role that Iraq will play in the future. The much debated and very controversial war in Iraq has drawn to a close with the last combat brigade leaving this war torn Middle Eastern nation seven years after US troops entered Iraq. The United States leaders politically and militarily are saying that the Iraqi people can now move ahead to become a major player in the nations of the Middle East. The United States remains ready to assist in the rebuilding process of Iraq and, in fact, will have a number of personnel to work alongside the Iraqis. As I report this end of US combat activities in Iraq, I am reminded of the role that Iraq will play in the future according to the prophetic scenario that can be found in Bible prophecy. John the Apostle, author of the book of Revelation, reveals in chapter 18 the importance of Iraq, known as Babylon in Biblical times, that Iraq will be an economic center of the world in the last three and a half years of the seven year Tribulation period. A world dictator, the Antichrist, will control all commercial activity from his headquarters in Babylon, modern-day Iraq (Revelation 18, Revelation 13:16-17). In fact, the last thing to happen in our world is for Babylon, modern-day Iraq, to be destroyed and then Jesus Christ returns to the Earth (Isaiah 13 - 14, Jeremiah 50 - 51, and Revelation 16:17-20). In Iraq the stage is being set for Bible prophecy to be fulfilled.